When Hope ran away from home at seventeen it was just the start of a downward spiral that led to mistakes that have plagued her since. Now accused of a crime, she's lost her job and housing. With a young daughter to care for, she finds a place at a church-run shelter. Nick Slater is a new assistant pastor at Headley Cross Baptist. His focus should be on his job and volunteering at the shelter, but when the same woman keeps crossing his path, he knows God has orchestrated their meetings and resolves to help her, no matter what it takes. 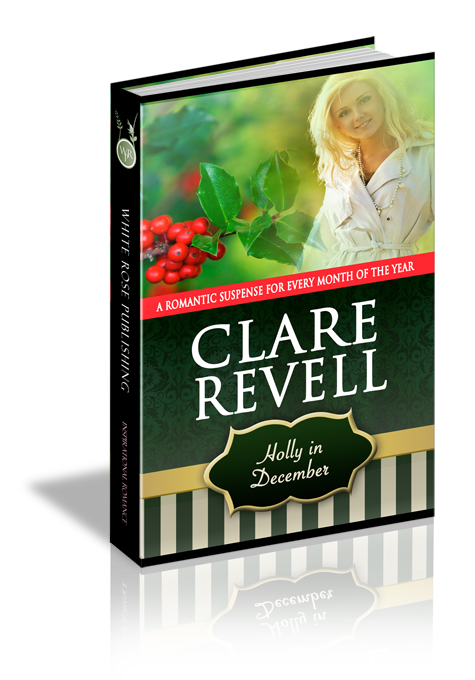 But even while scents of holly and fresh-baked pies fill the air with Christmas joy, and Nick finds himself falling in love with Hope and her little girl, the dark stain of Hope's past threatens to affect Nick's career. Should he ignore the urge to save his reputation, or is God teaching him a Heavenly lesson? The clock chimed nine as Hope Hargitay ran up the stairs and into the office. Almost late, but not quite, her morning had started with a dead alarm clock, a child who didn’t want to go to school, but then which child ever did, and a car that refused to start without a fight. It really needed to be garaged, not left on the street in the below freezing temperatures of an English winter. She dumped her bag on the desk, tossed her coat on the back of the chair, and consoled herself with the thought that the day couldn’t get much worse. She needed a mug of hot coffee and ten minutes to sit at her desk and read the case notes for today, before putting her calls in order of priority. Hope realized three things at once. Her desk, aside from her handbag, was clear and the inbox empty. Last night it had been full to overflowing. Second, the room was silent and everyone’s attention was on her. Thirdly, there was someone else in the boss’s office. She crossed the office, the only sound being her footsteps, her stomach pitting further with each step. This would not be good. Hope looked down at her hands. Who could hate her this much, that they’d spread lies about her? Hope shook her head. “What happens to the flat?” she asked, knowing what the answer would be. “I’m innocent. And I’m more than capable of looking after Angel,” Hope said quietly. They’d made their decision, and she’d let them stand and fall by it. She stood. “I’ll be off then.” She removed her pass from her neck and placed both it and her car keys on the desk. Without another word, she turned and left the office. She crossed back to her desk, silence echoing in the full room. Her cheeks and eyes burned as she picked up her bag. She’d put everything she had into this job. Turned her life around, made something of herself, for it all to be torn down and pulled away from her. The whispering began as she left the office and headed down the stairs. Why would anyone do this to her? She’d once lived the wrong side of the law, but that was before Angel was born. Since then, she’d gone to college, got good grades, a degree, a job, home. She pulled on her coat as she exited the building. The cold winter wind blasted through her, and she tugged the hood around her head. Tears blurred her vision as she began to walk home. Early Christmas shoppers thronged the streets. Bright lights shone everywhere, in a direct contrast to the dark despair filling her. She shoved her hands into her pockets as she walked. Would she even find a new job with something like this hanging over her head? Maybe something would turn up in a shop, but it had to fit in with school hours. Whatever happened, she wouldn’t lie to get new employment. Lying was one thing she tried not to do any more. If there was a criminal investigation going on, anyone would soon figure out who she was. Perhaps she should have chosen a more common surname when she’d changed her name by Deed Poll all those years ago. Like Smith, or Jones. She passed several houses bearing holly wreathes on the front door. Holly stood for respect, modesty, and faithfulness. Some of the things she’d lost around the same time she’d left home—run away from home. Stubbornness, pride, and fear had kept her away the past nine years. The prickly green holly plant with its blood red berries always reminded her of Christmas when she was a kid, in the days when she had a home and a family. Well, technically she still did, two hundred miles away in the Fens. Her parents had a holly tradition, something she’d carried on with Angel each year; although it never felt quite the same. Hope was never sure whether that was because she was grown up or because she and Angel were alone. And now they were homeless and, if she didn’t find another job soon, penniless. Still, she’d turned her life around once before. She could do it again. A block of flats loomed before her. She lived in the dank, oppressive and smelly housing without complaint as the flat came with the job. Some daft idea the council had about social workers relating to clients better, and using her as an experiment to see if it worked. Well, apparently it made her just like her clients! It was no place to raise her daughter, but neither were the streets. Slowly Hope climbed the stairs to the fifth floor, not surprised the lift still hadn’t been fixed. It hadn’t worked in all the years she’d been living here. Banging echoed down the landing as she reached her floor. She rounded the corner. The housing warden, Mr. Burns, pounded on her door. “I know you’re in there, Hope,” he yelled. “Actually I’m not,” she muttered. “I’m here,” she called, hurrying down the landing towards him. Mr. Burns nodded and stomped off to the stairs. Hope let herself into the flat and leaned against the front door. Tears filled her eyes. How much worse could the day get? Where did she go? The only family she had in town was an aunt, but calling her would be her last resort. She rubbed her hand over her eyes and looked at her watch. She had five hours before Angel finished school for the day. That should be enough time to find somewhere to live. She’d long wanted out of this flat and now she had it. Perhaps this would be one of the blessings in disguise her mother used to talk about, as did Faith, one of her sisters. But that was another lifetime ago. She moved to the window, watching the rain beat against it. One good thing about her job was she knew where all the homeless shelters, along with all the shelters for women and children, were located, in and around Headley Cross. And, more importantly, which ones to avoid. She pulled the phone towards her, hoping it hadn’t been cut off yet and grabbed the receiver. Hearing the dial tone, she began calling. An hour later she’d exhausted her list of contacts. No one had room for her and Angel. They could take the child, but not her, and that was not an option. Taking a deep breath, Hope called the last place on her list, but didn’t hold out much hope. As far as she knew this was just a temporary place open over the winter, taking people in on a first come, first served daily basis. “You can have room and board in exchange for work,” Mrs. Branning told her. Hope looked at the phone in disbelief. Was it really that easy? The following morning she took Angel to school and went back to the flat to finish packing what she could into the one case and two bags she owned. Even though she didn’t understand, Angel had taken the news they were moving with her usual aplomb and obediently packed her clothes and toys in the case. She’d actually been more bothered about the loss of the car than anything else. In the drawer beside the bed lay a photo. Battered with age and slightly faded, it showed her at sixteen, with her parents, two sisters and brother. Almost tempted to leave it behind, she slid it into her purse. Hope looked at the case and crammed the rest of Angel’s things into it. She wouldn’t need much herself, but was determined Angel wouldn’t suffer because of something that had happened to her. She shoved three changes of clothes for herself into the rucksacks along with toiletries. Then, she glanced around. Not much to show for five years of her life. Shouldering one rucksack, she stuck the other over the handles of the case and headed onto the landing for the last time. Dragging the case behind her, she stopped at the top of the stairs, wondering how she would get down the ten flights and five floors with the case. “Morning.” Hope nodded back. Manners cost nothing, or so her mother used to tell her all the time. She looked down the stairwell. As usual several of the lights were out, making it appear to be a yawning chasm. “Can I give you a hand with that case?” the man asked. He set off down the stairs, as if the case and bags were weightless. Hope followed, her mind whirling. She almost lost her footing twice and was grateful she wasn’t carrying anything. It wouldn’t be the first time she’d fallen down them. The man was waiting with her case at the bottom of the stairs. That surprised her. She’d half-expected him to leg it with all her stuff. He shot her a smile which showed perfect, straight white teeth. She shook her head. “You’ve been kind enough, sir. Thank you.” She didn’t want anyone knowing she was moving into a homeless shelter. “You’re welcome.” He nodded, as if tipping his hat like only a proper, old fashioned gentleman would do. She gripped the case before he could change his mind and insist on driving her. She headed down the street. She had to clear her name or hope that the investigation would. But even if it did, apparently her career was over.